If you're new to the Health Rosetta, learn more or see success stories. 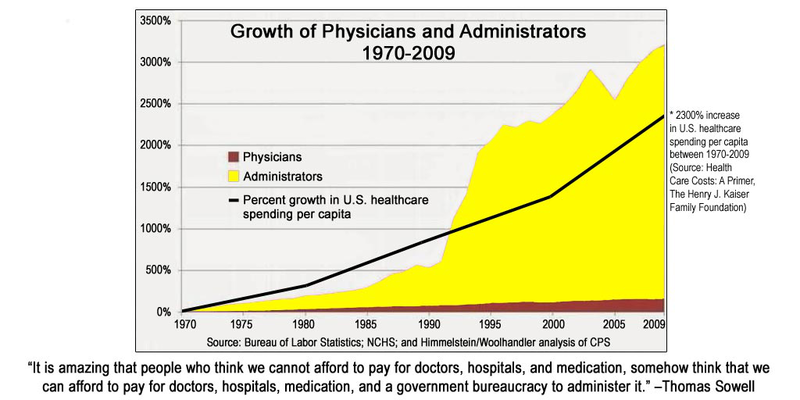 The graphic below shows how adding more and more layers of administration and bureaucracy has cost us dearly. As has happened in countless other sectors, there is an opportunity to use technology and transparency to gain enormous efficiencies. What is a Transparent Open Network? A Transparent Open Network offers purchasers such as employers and unions fair and fully transparent pricing for medical services/procedures ranging from specific treatments (e.g., knee replacement or colonoscopies) to specific conditions (e.g., diabetes or kidney disease). Services and procedures are typically bundled, meaning there is just one bill for all the services received for a specific treatment or condition that includes multiple providers and sometimes multiple settings. Another dimension of transparency is that the market is open to participation by any provider with sufficiently high-quality indicators and charges fair prices. Providers (typically independent imaging centers, specialty hospitals, and ambulatory surgery centers) supply up-front pricing at significantly reduced rates in exchange for increased volume, quick pay, reduced friction, and avoiding claims/collections problems—all factors that allow providers to charge greatly reduced prices while netting a similar amount to standard insurance billing. Providers contract directly with an employer or a third party aggregator to offer services outside of a typical payment and network structure. In exchange for significantly reduced rates, employers encourage plan members to use these providers, typically by waiving all of the individual’s costs including copays, coinsurance, and deductibles. Unlike FFS, which allows for wildly variable, opaque pricing free from market forces and that can incentivize providers to offer unnecessary services, Transparent Open Networks benefit providers, employers, and employees. Providers get access to individuals whose employers offer quick pay and reduced hassles, while employers get access to bundled, transparent rates at prices typically 30 to 50 percent lower than typical PPO network discount prices (and even more off of chargemaster prices). Employees get access to a new benefit that offers medical services and procedures without financial penalties in the form of copays and deductibles. In short, providers get easier administration and certainty, employers get great prices, and patients get the care they need at no additional cost. What Are the Key Elements to Look for? It’s not possible for employers to measure the value of their health care dollar without access to pricing and quality information. The same information is needed by employees if they are expected to seek high-value care. At a minimum, all medical services and procedures should be available at fair, honest, and up-front prices, making health care services as straightforward as other products and services we buy. Quality information should also be readily available for employers and employees alike. Traditional fee-for-services models reimburse providers based on the quantity of services and can encourage over-utilization. Bundled payment for a specific treatment or condition allows employers to reimburse providers for all the services needed across the entire treatment or condition. You trade endless, confusing, itemized bills for just one bill covering the hospital, surgeon, anesthesia, equipment, etc. For treatment across a specific condition there is just one bill for all physician visits, diagnostics, and care management. Fee for service payments can encourage overutilization and provide reimbursement based on quantity alone. Shared risk models encourage providers to account for the cost of services provided and the outcomes associated with services rendered either for a specific treatment or condition. Shared risk is most commonly addressed through a structure of global periods. Medicare has long required providers to share risk under 3 different global periods; Zero Day Post-operative Pare, 10-day Post-operative period and 90-Day Post-operative period. Medicare isn’t going to pay for mistakes, complications and re-admissions. Transparent open networks bring that practice to the private sector. Typical claims administration is filled with inefficiencies: slow payment cycles, prior authorization, network requirements, complicated payment models, employee cost sharing, etc. For a Transparent Open Network to function, employers must make it easy for employees to access care, offer quick pay to providers (typically five days or less), eliminate barriers like copays and deductibles, and often remove oversight requirements like prior authorization. It’s important to remember that the goal of this model is to simultaneously lower employer costs, reduce costs and eliminate hassles for providers, and provide a true benefit to employees and members. Models that encourage the use of specific providers for specific treatments are often a new idea for employees and their families. They need to understand that TMM is not like HMO models, which were often associated with denied care, long wait times, and poor customer service. The message needs to be simple, clear, intriguing, and just one sentence like this: Don’t forget, if you need medical care, we have a group of the highest-quality providers you can see, and choosing this won’t cost you anything out of pocket. Health care has always been confusing, frustrating, and very often scary. A Transparent Open Network should be effortless. Consider offering concierge-style customer service, which gives your employees easy access to the humans and resources they need, including hassle-free appointment scheduling, medical records transfer, and both web and mobile access. These services can also create comfort for your employees around sensitive health issues they don’t want to discuss with you or your internal benefits manager. Each component is ever-evolving. Please submit additions & changes. An effective Transparent Open Network functions best in tandem with a value-based primary care model and use of shared decision-making tools to avoid overtreatment and radiation exposure from unnecessary scans. Any high-quality provider should be participating in all applicable quality reporting whether they are a health system, ambulatory surgery center, imaging center, or independent physician practice. Here are some resources that can help ensure that the providers you use are, in fact, of the highest quality. HealthInsight is a private, non-profit, community-based organization dedicated to improving health and health care. They offer a free ranking tool for hospitals nationwide. The National Quality Forum (NQF) is a not-for-profit, nonpartisan, membership-based organization that works to catalyze improvements in healthcare. They offer access to a huge library of endorses quality measures. Hospital Compare is a government website that allows you to find and compare quality information for more than 4,000 Medicare-certified hospitals across the country. You can use Hospital Compare to find hospitals and compare the quality of their care. The Leapfrog Hospital Survey is the gold standard for comparing hospitals’ performance on the national standards of safety, quality, and efficiency that are most relevant to consumers and purchasers of care. The survey is the only nationally standardized and endorsed set of measures that captures hospital performance in patient safety, quality and resource utilization. Their online tool makes it easy to access survey results. Your broker, consultant, carrier, or TPA may be unable or unwilling to provide transparent specialty care and the administration to execute a Transparent Open Network. It is common for the large health systems you currently use to push back on requests for price and quality transparency. The process can be quite cumbersome and drawn out should you decide to go it alone. You might consider using a third party to help streamline the process. Transparent Open Network models require continued messaging and clear, easy-to-understand action steps for your plan members to ensure broad adoption. It could be difficult to obtain pricing and quality information from your current broker, consultant, carrier, or TPA. Since it is your spend, you have a right to this information. Traditional claims analysis software programs and services are often limited in scope and not designed to provide clarity or actionable insight. You're advisor should implement tools designed to ensure success. Many price transparency tools (e.g., Castlight) provide information on insurance PPO network pricing, but they don’t remove the hassles and costs for either providers or individuals related to claims, copays, etc. Your current providers who aren’t forward-looking are likely to use common “fear, uncertainty, and doubt” tactics meant to freeze progress. As stewards of your organizations’ and employees’ hard-earned money, you must choose whether to protect yours or your vendor’s bottom line. Ask your broker, consultant, carrier or TPA if they participate in any transparency initiatives. Encourage your broker, consultant, carrier, or TPA to make cost and quality data available to both you and your employees. Consider modifying your benefits plan to provide incentives for employees and their families to access care from transparent providers. Visit a local hospital or surgery center to discuss or consider tapping a third-party TMM vendor in your region or may expand to serve your employees. Catalyst for Payment Reform (CPR) is an independent, nonprofit corporation working on behalf of large employers and other health care purchasers to catalyze improvements in how we pay for health services and promote higher-value care in the U.S.
FAIR Health is a national independent, not-for-profit corporation whose mission is to bring transparency to healthcare costs and health insurance through comprehensive data and consumer resources. Physician Quality Map - Visual representation of the concentration of top-quality primary care physicians (PCPs) per capita in each county across the U.S.
CommonWealth Fund: Health Care Price Transparency: Can It Promote High-Value Care? Would it be helpful to list vendors offering the service? Do you have other forms or requirements that would need to be addressed? Are there tools we should use to manage/update the various Health Rosetta components (currently, it's collaboratively edited in Google Docs). Acknowledgements and Disclosures: The initial draft of this was completed byJim Millaway, Benefits Consultant for HUB International and founder of The Zero Card.